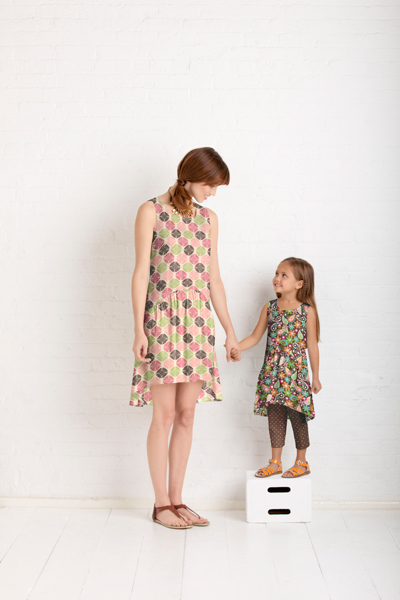 This new Little Lisette style, Simplicity 1892, is my version of a mother-daughter dress. This design idea came to me a while ago as I was thinking about styles that would be appropriate for women and girls alike. I think the high-low hem is a fun detail that keeps the style lighthearted and not too serious. I love this style with ballet shoes or little flat sandals. This is a casual summer dress, and the little pants for the girl help to pull the style back from being too matchy-matchy. 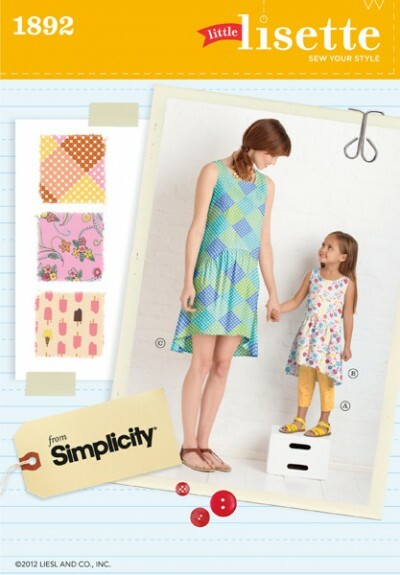 It’s a very quick, easy style to sew and is perfect for highlighting a fun print because the lines are so simple. The Lisette and Little Lisette fabrics were at the top of my mind when I designed this style. I thought it best to let the fun florals and prints talk for themselves and keep the details to a minimum. As always, I can’t wait to see what you make with these patterns! I hope you’ll post your photos to the Lisette Flickr group. Love the brown print on the little girl…Brown is my favorite! Hope it is coming soon!